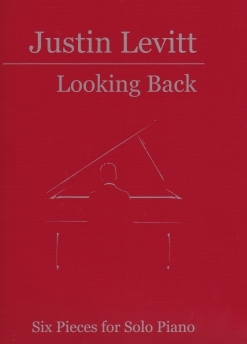 Looking Back is Volume 6 in Justin Levitt’s series, Six Pieces for Solo Piano. As the proof-reader and editor of this series, I have to say that I really enjoy Justin’s music and the variety of musical styles that he is so good at expressing himself with. All six books contain pieces that are very different from each other - from classical to pop to jazz to blues to romantic ballads, Americana and novelty pieces. 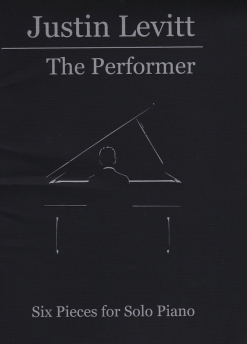 None of the books are at a beginning or even intermediate level, but pianists at an early-advanced to advanced playing level should have little difficulty in mastering this music with some practice. The first place winner in the MTAC Composers Today State Composition Awards for four of his pieces (from Volumes 1-4), Levitt has performed at Carnegie Hall and has had his music performed by professional symphony orchestras and danced to by The Diablo Ballet in Northern California. I do believe we have a major musical force emerging here! As a very big bonus, Justin Levitt one of the nicest people you’d ever want to meet! His warmth and humor run throughout his music, which he calls Life Music. Looking Back is my favorite of the six books in the series (so far). Here is a quick synopsis of the pieces: “Mr. Bach’s Wig,” a three-part suite composed in a Baroque style. “Hold You” is a tender love song. The fascinating “Flutterby” was composed so that much of it looks like butterfly wings on the page. It has several sections that are different from each other, but most of the piece is played quickly and lightly to suggest the flight of butterflies. “Watches” was composed in answer to a request to compose a piece based on “Clocks” by Coldplay. “Looking Back” is sweetly nostalgic in an Americana style. “What I Want for Christmas” is a romantic comedy about unrealistic expectations at Christmas and is a blast to play! All of the books in the series are beautiful to look at as well as to play. Volumes 1 and 2 have dark blue covers, Volumes 3 and 4 are gray, and Volumes 5 and 6 are bright red; all of them have silver line drawings and text on the cover. The paper stock is substantial and should hold up to many years of use. The books are printed in the 9”x12” format, making the music spacious and very easy to read. They are stapled and stay open on the piano from the very first use. The books also include a composer bio and a note from Levitt about how to approach the music as well as his notes about each piece. Some of the pieces are more complicated than others, but none are daunting. Currently, the books are available exclusively from www.JustinLevitt.com. Very highly recommended!